Wednesday's edition of Fox & Friends was definitely foxier than it was friendly. Fox News correspondent John Piro was in Louisville, Ky., for a segment titled "Breakfast in the Bluegrass State," but instead of the pancakes he was supposed to be enjoying with the patrons of Christi's Café, Piro was instead served up a generous helping of drama. "You've got a Democrat right here!" an unidentified protestor announced, suddenly stepping forward to display a homemade "FOX LIES" sign. "This is fake news!" 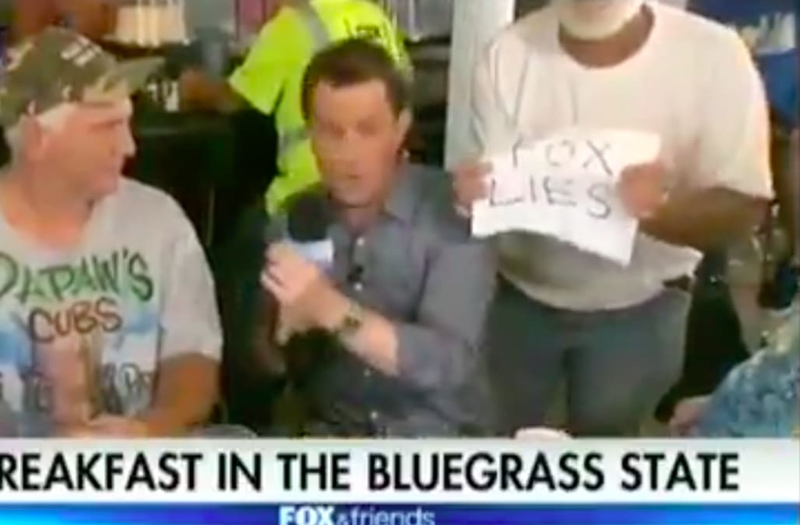 Unfortunately for the protestor — whose face was never clearly pictured — that's all he was able to say before the camera cut back to the Fox & Friends studio in New York City. Co-host Steve Doocy explained, "We don't know exactly what was going on there, but they felt for ... in the best interest of the telecast, we cut away." Trump praised "Fox & Friends" in a recent speech. Watch above.